With only 3 days left on Indiegogo, the Wunder360 S1 has pledged over $350,000 — 1760% of its original crowdfunding goal. 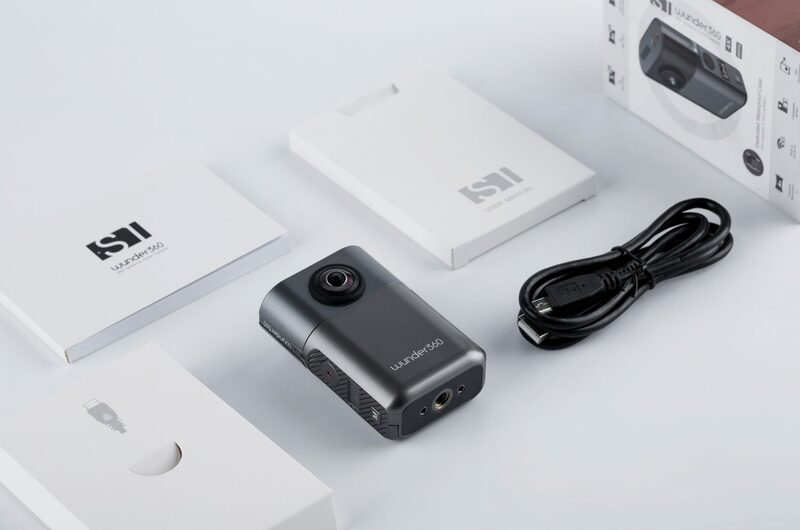 At first glance, it’s just another action camera but when something gets promoted as the world’s “First 3D Scanning & 360 AI Camera” — and it costs $135 (early bird price, MSRP will be $299) — I naturally need to look into it. If you look at it, you’ll see a well-designed (I actually think it looks really nice) 360-degrees action camera with two back-to-back fisheye lenses, a few buttons and a tiny screen. To me it looks like the love child of the popular Ricoh Theta ($370) 360-camera and a even more popular GoPro Session Action Camera ($129). Feature-wise, you can put it in a waterproof case and mount it on a helmet — or a dog. There’s the automatic real-time stichting of the two camera feeds and some “AI” that can detect people and keep them framed in the center, and electronic image stabilization. Nothing you haven’t seen before. So to make this device stand out, the Chinese manufacturer is trying to add something new: “3D scanning”. They’ve even put the term before “360” and “AI” in the tagline of the product. It’s not yet a buzzword like VR or AR, but it’s 3D and people are slowly being told that they need volumetric 3D models of interiors and exteriors in their lives. Which is kind of a stretch for consumers but the page mentions creating Minecraft levels — so it’s legit. And professionals like architects that own a $3000 HoloLens probably don’t have any money left after that purchase so a $135 3D scanner must appeal to them instead of, let’s say, a $15k Leica BLK360 LiDAR scanner. Anyway, if you look at the marketing material (which there is a lot of and it’s all very professional, high-production value content) it indeed looks very interesting. Just walk around with the camera on your helmet and 3D models you will get. Scanning interiors seems to be the main focus and images like the one below (even with multiple floors) make it look like things you might have seen when viewing interactive “dollhouse” views from Matterport or output from Google Tango phones (may they rest in peace). But how does that work? The Wuder360 S1 only has two 2D fisheye cameras. There are no infrared depth sensors Google Tango and the Matterport cameras. So the “3D scanning” is actually a software-based SLAM approach, or Photogrammetry. The 2D 360 footage (not sure if it sends the 3K video or 4K stills) from the camera is transferred to the connected smartphone and than uploaded to the cloud for processing. If it works this is a very nice end-to-end workflow, which can make this kind of 3D interior capture user-friendly enough for beginners to operate. 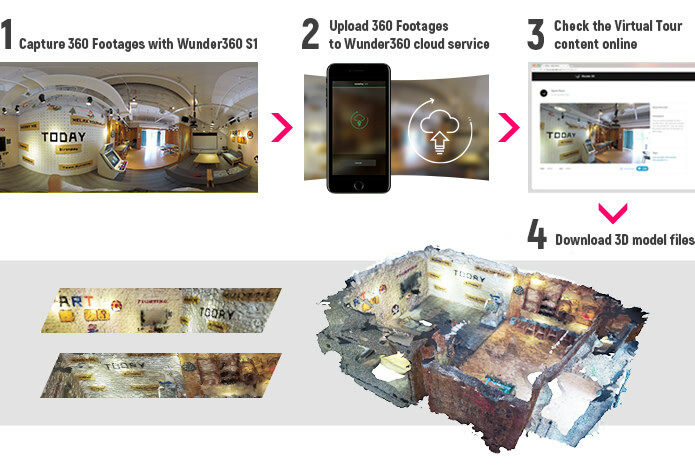 The product page states that the Wunder360 S1 comes with a content storage and publishing platform, a universal web-based 3D player, and a tool to create virtual tours. It makes total sense that cloud services will have a subscription model. And even large companies like Autodesk have proven that 2D-to-3D service are simply too resource intensive at scale to be free — even with a very limited amount of input data (ReMake Free had a 50 photo limit). To reconstruct entire buildings in 3D the cloud service has to process a lot of image data. And although I can’t really judge the resolution of the end result, mutli-room 3D models can also be quite large in file size. To make services like these even possible for free (or for small pices), developers typically implement waiting queues for submitted projects. So depending on the server capacity available for this specific service, I expect some serious waiting time before you can see the end result. And because photogrammetry still relies on a lot of guesswork, good results are never guaranteed. Certainly not outdoors with factors like moving objects and variable light conditions. So I’m really curious to the business model of the cloud service after the first free year. I’ve reached out to the manufacturer for this and will update this post if I have more information. An end-to-end solution is nice (certainly with cloud-based service which makes a lot of sense for a mobile solution). But if you already have a 360-degrees camera like the Ricoh Theta or Samsung Gear 360 or an Action camera with a wide-angle or fisheye lens like the GoPro Hero or GoPro Session you probably won’t buy a new camera that does largely the same. But maybe you do want make 3D captures of interiors, exteriors — or, anything! Then it’s good to know that many of the photogrammetry applications I’ve reviewed also support fisheye and 360-degrees images! If you have a decent PC and want to test if this works with your camera, you should really try the Free Version of 3DF Zephyr (Review). And if the 50-photo limit of the free version proves to be to few for a good reconstruction of your interior or exterior of choice, you can get a great discount on 3DF Zephyr free — which can process up to 500 photos or stills from 360-videos — on my Deals Page. The Wonder360 looks like a very nice and capable hybrid between an Action camera and a 360-degrees camera. I totally get the popularity on Indiegogo. But it’s good to know that this is not just an hardware offering. Much of the USPs come from the added software. And this is certainly true for the highly buzzed “3D Scanning” feature. If that feature actually works robust enough depends on a lot of factors so I’ll have to actually do a hands-on review of this device before I will say anything concrete about the usability of the generated 3D models. And after the first free year, actual use of the feature will really depend on the business model of the cloud service. For example, will users be able to keep sharing scans they already made when their subscription ends? And will consumers even pay for a feature like that they probably only use occasionally. Time will tell! But then again, for $135 (okay it will eventually costs $299) this looks like a very nice Action/360-camera that will be worth its price even without the 3D capture feature. Follow me on Facebook or LinkedIn if you want to be the first to be notified when I have the information about the subscription pricing. With the Wrapping Up features you can easily be extended with the MS Excel features and with the features, you can able to know all the latest updates and principles of using it. at&t customer service on Wunder360 S1 is a $135 pocketable 3D Scanner — or is it?